Can you tell us a bit about your Secrets and Scandals series? It’s about secrets and scandals. I kid! I love me some good scandal and so there’s lots of it, or threats of it, running through all of the books. The books are loosely connected in that characters appear in multiple stories, but the series doesn’t need to be read in order. I do think the last three books work best in order, but mostly because the events happen in pretty rapid succession, especially in the last two. All of the books are available except the final installment: Scoundrel Ever After, which will be out in the fall. 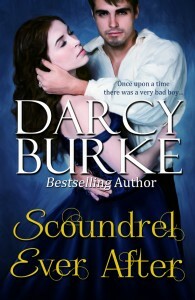 I loved your book Never Love a Scoundrel, but for our readers, what they can expect from this latest installment of S&S? How does Never Love a Scoundrel differ from your previous books? Thank you! Never Love a Scoundrel is a great story because it’s about an unlikely hero and heroine. I’d introduced Lydia as a sort of “mean girl” in His Wicked Heart, never imagining I’d write her story one day. Then she appeared in To Seduce a Scoundrel and I began to get a feel as to why she acted like she did and I wanted to tell her story. Since she was so obsessed with gossip and scandal, Lockwood seemed the perfect hero for her. He hosts notorious vice parties—it doesn’t get much more scandalous than that! The scenes at Lockwood’s parties were definitely a highlight. What’s next for you? Any great projects on the horizon? The last book of the series of course, Scoundrel Ever After, which is about the baddest boy of them all, Jagger. Audrey’s the perfect foil for him. And secrets! She’s got plenty. J It’s going to be so fun! That’ll be out in the fall, hopefully around the first of October. Also in October, I’ll be in a Christmas anthology with two fabulous writers (who also happen to be my friends and critique partners), Erica Ridley and Emma Locke. It’s going to be a great trio of novellas—a Regency-set historical, a contemporary romantic comedy fantasy, and a straight contemporary, which I’m writing. There will be something for everyone. My novella is actually the prequel to a contemporary series that I’ll be working on next. I also have a new Regency-set treasure-hunting series that I’ll start after the new year. That sounds great! Any advice for others thinking about self-publishing? The best advice I can give a writer who’s looking to self-publish is to create the best product you can and thoroughly educate yourself. At this point, there are a ton of wonderful resources available, so there’s no reason not to be able to learn about all aspects of the business of self-publishing. I’m an author, but I’m also an entrepreneur because all of the business decisions fall to me. That’s both daunting and exciting. I really love the freedom I have to write what I want and produce it in the way that I want. I love that I can wrap a book up this week and know my readers can enjoy it next week. Above all, I urge those interested in self-publishing to be as professional as they can be—both in their production and in the way they approach their job, because it is absolutely a job. And it’s a job I adore! What is your writing process–are you a plotter or a pantser? Do you do an outline before you start writing? I’m both—a plantser. I used to do plot boards (and even gave workshops about using them), but haven’t for a couple of books. I still plot out turning points and write to those so that I know where I’m going. I couldn’t be a total pantser—I have to be able to see an arc, both for the characters and the story. I just wish I had a repeatable process! Maybe then I could write a little faster. 🙂 I’m actually doing a scene by scene outline for Scoundrel Ever After. We’ll see if that’s a process that’s successful and repeatable! And the question we ask everyone who visits the Tearoom: if you were trapped in a burning building and could only save 5 books, which would you choose? 1) Harry Potter and the Deathly Hallows (though Prisoner of Azkaban and Goblet of Fire are a close 2nd/3rd) because I just love the series and I can only pick one because I only get 4 other books! 2) Almost Heaven by Judith McNaught because there are multiple scenes in that book that I will never, ever tire of reading. 3) Shanna by Kathleen Woodiwiss because Ruark Beauchamp is simply too good to be true. 4) Wolf Hall by Hillary Mantel because it’s a dense, delicious read. 5) My grandmother’s scrapbook from the 1920s and 30s. I know that’s kind of cheating, but I would hate to see it burn. It has fantastic pictures of Hawaii before it was a state, a cross-Atlantic trip to Europe (with waves practically crashing over the sides of the ship), and so many amazing pictures of my dad’s family. Awh, that’s so sweet. I’ll have to add your other books to my to be read list too. To one lucky commenter, Darcy will give a copy of any of her backlist books, paperback or e-book (winner’s choice). This is a giveaway you don’t want to miss out on! All of your books look wonderful Darcy. There is no reason why self-publishing & professional should not go hand-in-hand. Your Grandmother’s scrapbook would be irreplaceable. I couldn’t agree more, Mary! Thanks so much for stopping by! Darcy Burke is my fave! I can’t wait for new stuff… Super excited to read about Jagger though!!! Thanks for the great giveaway. Can’t wait for the new book. Welcome to the Tearoom Darcy! Thanks so much for being here and it’s great having you. Your Secrets and Scandals series sounds so intriguing and appealing-I have so many of your books on my Kindle-I just need a year off so I can tackle my monster of a TBR pile, lol. Thank you for sharing your thoughts on self-publishing. It was so informative and helpful. I’m still at the beginning of my writing career, and your advice gave me a lot to think about. Lisa, my TBR pile is ridiculous!! Thanks so much for having me here! I love reading your books. They are so amazing. I would have to go with Almost Heaven by Judith McNaught. Great interview and advice. I hadn’t heard of you before, but I’ll check out your books. Your covers are wonderful. Who does them? Hi Ella! Your last name is my daughter’s name. 😉 Patricia Schmitt (Pickyme) designs my covers. She’s so good! So many wonderful stories, I want to read them all. Definitely on my to read list. Also, you’re yet another person who has mentioned Judith McNaught’s Almost Heaven, so I must read that, too. Loooove that book. I have dogeared sections I’ve read over and over again… Thanks for visiting today! Clearly I have got to read these books. They sound wonderful. I’m with Lisa, thank you so much for sharing your thoughts on self-publishing. Here’s to hoping your stories never stop flowing! Thank you! My problem right now is too many stories and not enough time to write them! These books sound wonderful! More to add to my reading list 🙂 Looking forward to May 15th!